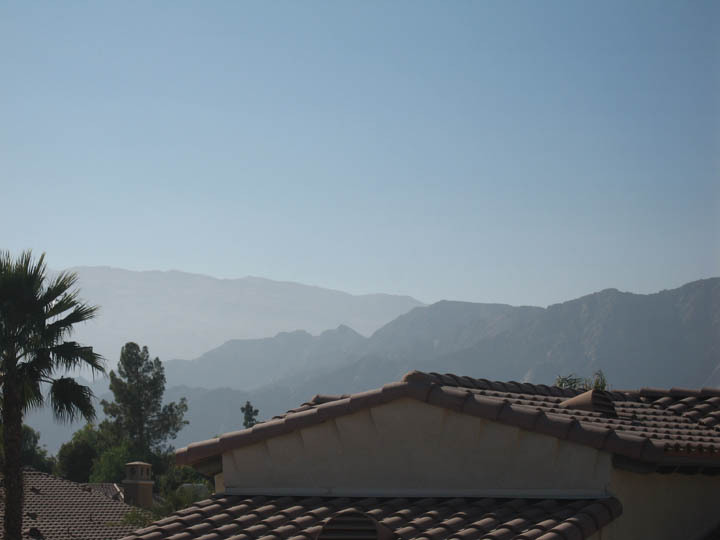 Rancho Santana is a newer gated community in La Quinta with only 168 homes, which have been built in stages from 2006 to 2012 and range in price from the high $400,000’s up to $1,125,000. There are still a few lots left for future luxury homes to be built upon. The Mediterranean-style homes range from around 2800 to 4650 square feet, and all offer granite countertops, high ceilings, walk-in closets and other luxury features and amenities. Some come with their own private pools and spas, and some have skydecks which allow a feast for the eyes of panoramic mountain views. 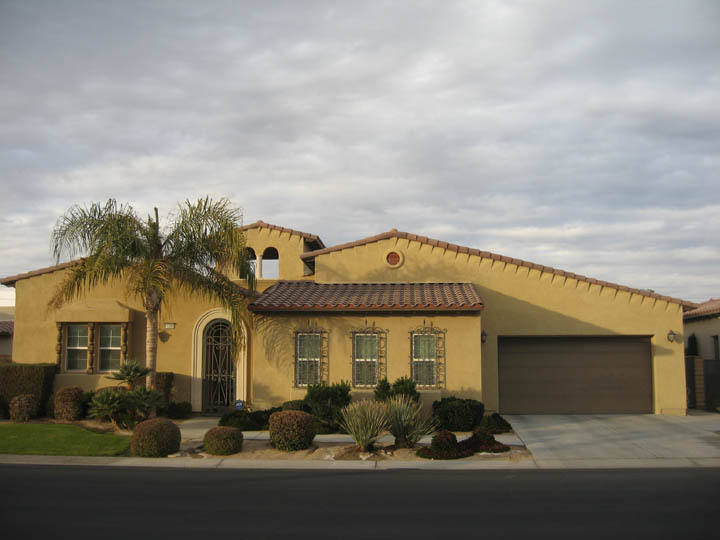 This home, which is currently my listing, at 81598 Ricochet Way, is offered for $534,000. It offers 3184 square feet of luxury living space which includes 4 bedrooms and 4 bathrooms. 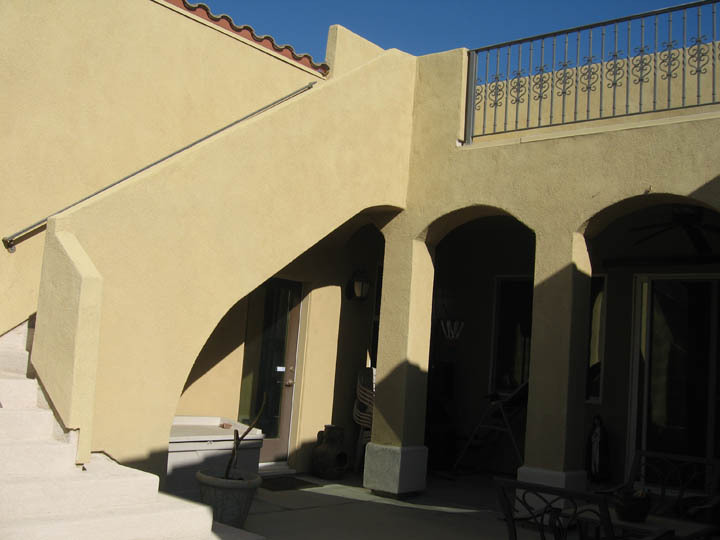 This includes an attached casita, with its own entryway: perfect for guests! High ceilings, granite counters and an island in the gourmet kitchen, two fireplaces including one in the retreat of the en suite master bedroom, custom tile floors inlaid with decorative European-style designs, and much more, make this a very special place to live. The energy bills are kept low due to the zoned AC/heating and the energy provider is IID (Imperial Irrigation District). This lovely home with many designer features includes a skydeck with these fabulous views (below)! This photo does not do it proper justice! It’s a great place to sit back and watch some of our spectacular desert sunsets. There is a wet bar and covered area as well. The gate to Rancho Santana is located on the south side of Avenue 52 just east of Monroe Street, and the westside of Rancho Santana is next to the uber-prestigious Madison Club, which features a private world class golf course and multi-million dollar luxury homes and estates. Rancho Santana has very low HOA dues ($142 per month for my featured listing) and offers walking trails, a putting green and a playground area surrounded by lots of green grass. 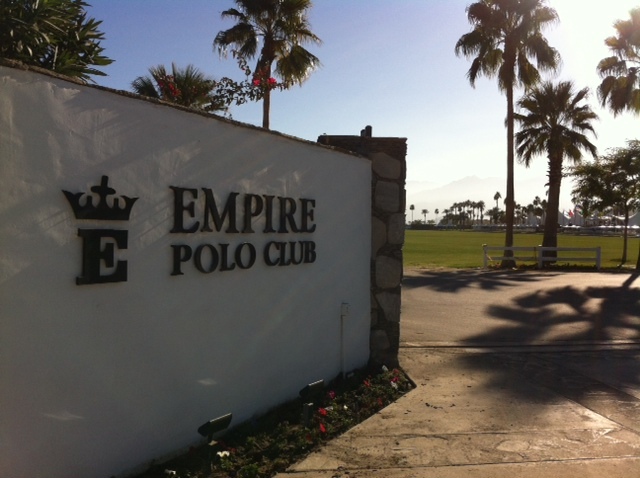 If you love horses, there are two world-class polo clubs with restaurant right around the corner! 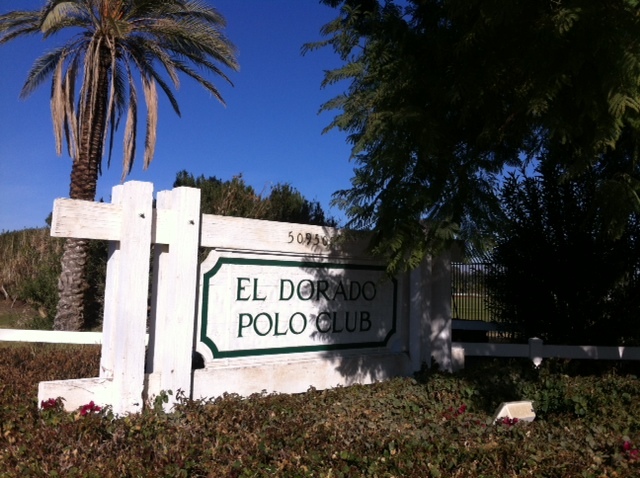 Empire Polo Club has entrances on Monroe St. and Avenue 50, while the El Dorado Polo Club has an entrance on Madison Street. 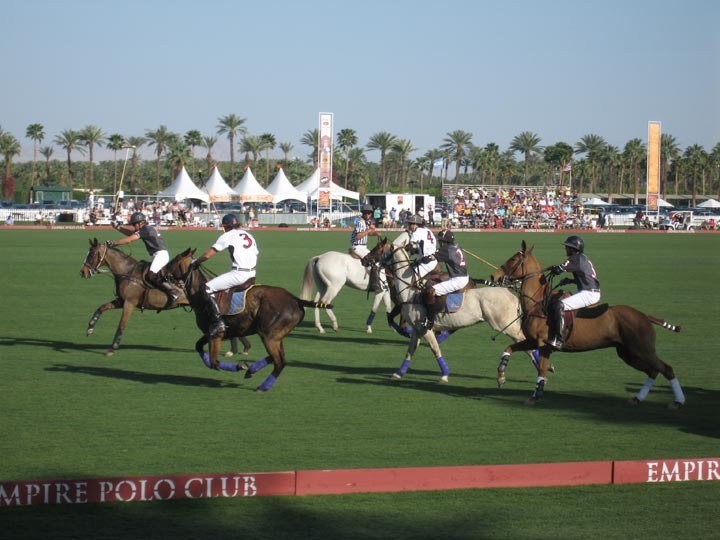 Watching the polo matches while tail-gating or sitting in a cabana is a wonderful way to spend Sunday afternoons. If these two top-notch polo clubs were not enough for horse-lovers, Rancho Santana is just a short drive to the Horses In The Sun events in Thermal, where riders from around the world showcase their jumping skills and more equestrian talents. If you love golf, you are in luck. As a resident of La Quinta, you will have discounted rates to play at the prestigious SilverRock Golf Course, which is just down the road a short distance from Rancho Santana, on Avenue 52. Of course, the entire Coachella Valley is a mecca for golf enthusiasts. 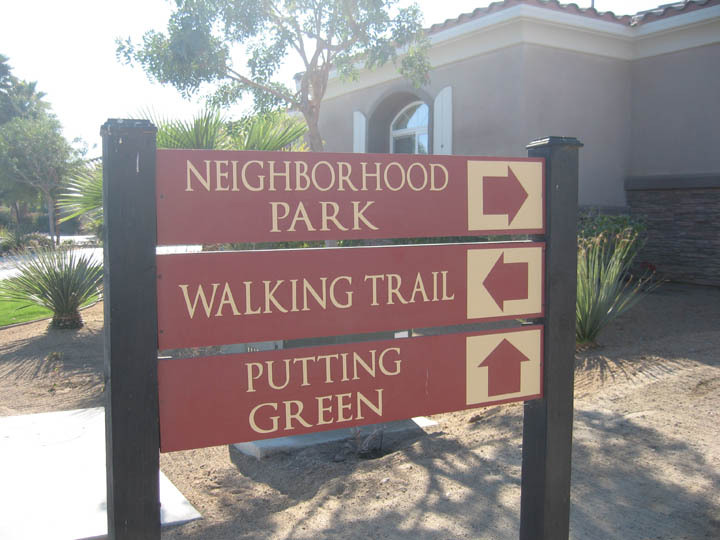 There are about 120 or so golf courses throughout the Coachella Valley and many of them are public courses. For instance, Indian Palms CC is a very popular golf community with public golf courses and it is just around the corner on Monroe at Avenue 48. I have listed and sold many homes and condos in Indian Palms Country Club, which offers many amenities including an on-site restaurant, fitness club, tennis courts, community pools and more. My listing at 81598 Ricochet Way in Rancho Santana is great for either a second residence or even full-time, since when you need to get away from the summer heat, the coastal beaches are only about a two and a half hour drive away. Or you can escape to the mountains in about the same time. “Snowbirds”, people from colder climes, flock here during our season, which begins in October and ends in May or June, because of the balmy weather and beautiful scenery of mountain vistas, fountains, colorful flowers and towering palms which line the streets. 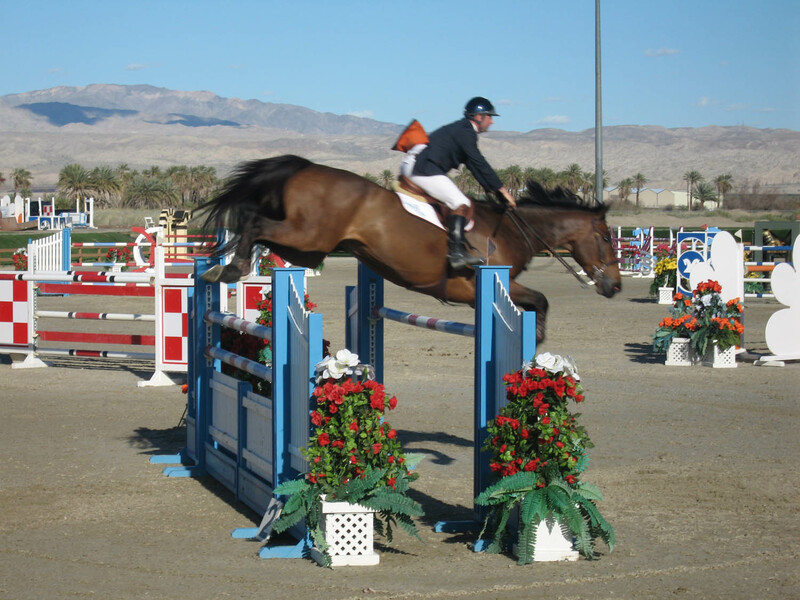 There is plenty to do, besides the afore-mentioned golfing and horsing around, such as world-class shopping on El Paseo in Palm Desert, our “Rodeo Drive” in the desert, with a Saks Fifth Avenue, Gucci, Jill St. John, Ralph Laurent, Louis Vuitton, and all the rest. There are film festivals, Fashion Week, concerts at the McCallum Theatre, art museums, outdoor shopping and marketplaces, hiking, biking…the list goes on and on! Whether you are interested in a house or a condo here in “the desert”, I can help you find what you are looking for and assist you with achieving your real estate goals. Please call me at 760-587-6009 or e-mail me at wendysdesert@gmail.com to start the process!